Some roads are not meant to be taken. India ranks unusually high on the list of countries which experience traffic collisions and fatal accidents. This is partly due to rash driving and inexperience. However there are a host of dangerous roads in India which are roads that lead directly to the Inferno. We list here 5 deadliest roads in India. Drive safely. Check your batteries, so you don’t get stuck. Put on your helmets and tighten the seat belt…. 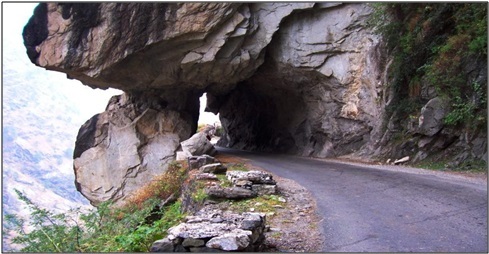 Kinnaur Road: If you are looking for a thrilling road, and we mean THRILLING, Kinnaur road will blow your mind away. Mind you, it is definitely not for the faint hearted and for the uninitiated in the art of driving on mountain roads. The road lies in the Kinnaur district of Himachal Pradesh, in the south west of the state. It borders Tibet on its east. The roads that connect it to the rest of the country have had to be made by cutting into rocks and the sheer rock face. The result: you have a twisted and looping road with rocks hanging perilously over head. It is like driving under a canopy of rocks. Because of its sharp curves it is extremely dangerous, often making the drive a blind one. Khardung La pass: Recorded in the Guinness Book of World Records as the highest drivable road in the world, this deadly beauty of a road is situated around five and a half thousand meters above sea level. Like any high mountain pass, snow, mudslides and loose rocks pose the most amount of threat. However, its sheer height, slope and narrow turns make it extremely dangerous. Some local legends suggest you have to appease many spirits of those who died on the road so that they allow you to pass safely. ‘Taxes’ range from cigarettes to a spot of brandy and water bottles. Zoji La pass: Situated in Jammu & Kashmir, this road is like a passage to hell in the Paradise on Earth. If you travel to Leh, you will come across this steep, narrow and slippery road. The continuously melting snow makes this road prone to mud slides. A few loose rocks can block the road. During summer, flocks of grazing sheep are equally intimidating! A small mistake and you will fall 3500 meters, just like that! Munnar Road: One of the many beautiful hill stations in India, Munnar is located in Kerala. The road stretches for around 135 kilometers, between Kochi and Munnar. It is breathtakingly beautiful with lush greenery and idyllic villages. The road is very well maintained. However, it is very dangerous because of its sharp bends and the dense fog that develops without warning. The winding and narrow passage blocks vision at places. At night, speeding trucks are a major threat. Mumbai-Pune expressway: This road is dangerous simply because of the volume of traffic that it deals with. High speeds and reckless driving, plus fog add to the problems that the winding road poses. However, reports indicate that most accidents happen here due to driving errors. Almost a thousand fatalities have occurred on this road.